When should you test your website? A stock answer might be, “During the Quality Assurance phase of a redesign.” And that is a good time to test things. But there’s a deeper answer to the question of website testing. In a perfect world, we would do fully test-driven development. This would allow us to test various aspects of the site during every phase of web development. It takes a bit more time, but ultimately creates a solid product built to last. In the chart above, we’ve diagrammed how website testing could be applied to each phase of a website redesign. Such testing is designed to ensure the best possible end product. At the project start, there is a step before any new work begins. This is to set up analytics, heatmaps, and other tracking. It’s an important step. If you don’t really know what people are doing on the current site, it will be tough to improve on it with a redesign. This type of data is helpful for finding where on a page users fall out of the funnel. Piwik, Mixpanel, or Heap Analytics offer more granular tracking than basic analytics. They can help explore usage patterns and user info. When there’s a specific question to answer, these tools can help get you to the answer faster with funnels, cohort analysis, segmentation, and more. Tree testing does not actually use the website itself. During these tests, users are presented with text lists and given a task to complete. One example task would be finding an ecommerce product. Then the Information Architect observes the steps taken to navigate down to that specific item. IAs use tree testing to confirm that the structure of the information makes sense. Then they will iterate on that to make the structure as efficient as possible. This test examines what a user clicks on first in order to complete their task. It can be performed on a functioning website, a prototype or a wireframe. They are good tests to run on existing sites during the IA phase. They help provide important user needs and preferences to the Information Architect. According to MeasuringU, a user who clicks down the right path on their first click will complete their task successfully 87% of the time. That makes first click tests useful on wireframes to evaluate (and hopefully confirm) that the layout of information supports and communicates the proposed navigation structure. A/B tests splits traffic to a page in two buckets, and serve a different option to each bucket of users. A/B tests can be used to measure interaction based on different calls to action or page layouts. Employing the right tests at the right time help minimize waste and ensure you move forward with the best possible version of your site or app. One other way an IA or UX expert may test a proposed feature is with paper prototyping. This involves making a paper version of a wireframe. Pages and pieces can be moved around based on “user clicks on the screen” (finger presses on the paper). This is a quick way to gauge user reactions to a variety of ideas. And since it uses paper, no developer time for coding is invested on ideas that don’t thrill end users. One other test-related activity that may take place during IA is requirements gathering for transactional tests. Doing this early on allows the team to create designs that accommodate all the required features and processes. The tech team can also start planning tests their code must pass in order for the site to do its job. As wireframes get approved, the visual design phase can begin. During this phase, high fidelity testing may take place. This differs from the paper prototyping in the IA phase. These prototypes will include design elements and will likely be on a screen and clickable. They will not be coded but may use a program like Adobe Experience Design that simulates coded interactions on design comps. Such tests can measure user reactions to different images and layouts. For example, if there is a large image area on a homepage or landing page, the design phase is a good place to test the gaze of people in those images. 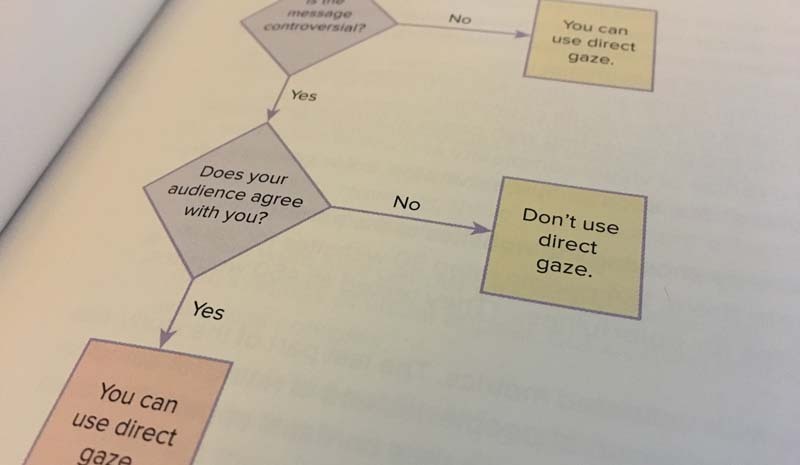 In 100 More Things Every Designer Needs to Know About People, Weinschenk share a flowchart to decide which gaze is best, but this could always be tested for your site’s unique audience. The design phase is also the time to do desirability testing if time and budget allows. Experience questionnaires and quick memory tests are good ways to gauge emotional responses and attitudes toward site designs. Once developers are ready to have implemented approved designs into code and added interactive features, the temptation is to start writing that code right away, and worry about testing it afterwards. This is not the best approach however. A better idea is to write the tests first. In fact, this is where the concept of “test driven development” actually originated–an idea that grew out of the test-first philosophy of extreme programming (XP) before being formalized as TDD by Kent Beck, one of the original co-authors of the Agile Manifesto. In this conception, developers begin by creating unit tests that correspond to the requirements captured (ideally in an iterative manner) in specification work with clients & users. These tests will of course initially fail (after all, the code to make them succeed hasn’t been written yet! ), but the important thing is that when they do succeed, developers know that their units of code do in fact fulfill the requirements they have been given. In short, this methodology, properly executed, can prevent code that does not meet requirements from getting into the production. TDD is all about having a high degree of confidence that your code really does do what it was meant to do. It’s crucial that the Unit Tests built during TDD test the smallest modules (“units”) of a code base that can be independently exercised. Once written, such unit tests should be runnable over and over, using an automated process. That way they can be put to use during QA and after launch for regression testing, to keep the code base in a known-good state even as changes are made to it. QA should also ensure developers are using forward-compatible methodologies. This practice leads to code that will work as designed in browsers adhering to modern web standards, now and in the future. A note about forward compatibility: it does not cover minute default browser rendering variances. Nor does this guarantee code will work in all future versions Manufacturers may introduce breaking changes from time to time. Our friends at ZingChart recently blogged about the trend of website errors after browser updates. At PINT, we monitor these industry trends and try to alert clients when their codebases should be upgraded. Transactional monitors help alert us when some necessary part of a process gets changed or fails and unexpectedly breaks a process on the site. It is best to set up transactional monitors after everything has been tested. That way they are monitoring a known-good process. Alerts can make you immediately aware of when something starts erroring, so you will know it before your customers do. Good RUM tools and services can also conduct this monitoring from a number of different geographical locations, and under a number of different bandwidth and device conditions, thereby covering your entire target audience in all its diversity. This is the same type of website testing that may have occurred during the IA phase. However at this stage, the point of the test isn’t to test different new ideas against each other. Post-launch, you’re more likely to test the new site against new ideas that emerge after reviewing user activity patterns. What changes will help move users further down the funnel? This an important step. If the web team updates processes on site but doesn’t update the monitoring tools and tests, they will all break. But testing is also helpful if you’re trying to encourage evolution. It doesn’t matter whether your team is resistant to change or on a tight budget. Suggestions for changes backed up by user data or performance metrics are much harder to turn down. Looking for help gathering data or setting up tests? We help people do just that every day. Let’s talk.